I have an older Ashford Traditional and the pin in the axle keeps working itself out, every few treadles. It is quite noisy and makes a clunky sound even with proper oiling. The more I use it, the noisier it becomes. Sorry to hear of your clunky wheel problem. I’m pleased to know that your wheel has had so much use it has developed this problem. What has happened is that the 1/8″ diameter silver steel hub pin has worn the hole in the mild steel crank such that it is oversize and allows the pin to clunk. A simple but temporary solution is to remove the hub pin and hit it with a hammer so that it has a slight banana shape. Then tap it back into the hole. A better and permanent solution is to order a “Clunky Wheel Kit” from your local Ashford dealer. This kit includes a new crank, hub pin and con rod. It’s easy to fit and will make for silent spinning. My con rod joint keeps breaking and I can’t understand why. I am not treadling hard and the wheel revolves freely. Check that the gap between the bottom of the con rod (pitman) and the treadle rail is at least 1/2″ (10mm). If closer the two can bind thus stretching and eventually breaking the joint. I have both the Traveller and the Traditional Ashford wheels. I am interested in purchasing the necessary equipment to do lace spinning. Which wheel would you recommend that I adapt? There are several items in my maintenance kit that I have no clue as to what they are, or how they work. A clear short length of solid plastic tube? – This is the con-rod joint now supplied in all spinning wheel kits. The new plastic con-rod joint replaced the leather joint on older model spinning wheels. On current models you will notice a hole drilled in the con-rod (the wooden piece that goes from the crank to the base of the wheel) to take the plastic con-rod joint. A small piece of white ribbon? – This is the threading hook tape. Tie it to your threading hook to conveniently hang your hook on your wheel. A tiny flat back circular piece of metal? – This is the E-clip now supplied in all spinning wheel kits. This replaced the rubber O-ring which is placed on the end of the metal crank (which goes through the middle of the wheel). There is a groove cut in the crank to take an O-ring or and E-clip. Why does the drive band keep popping off my Elizabeth when I set it in double drive? It is likely that the bobbin whorl is not quite in line with your wheel. This can be easily corrected by loosening the bolts securing the main wheel supports under the base. Twist the supports slightly so the wheel moves to the left or right until correctly aligned. Then retighten. As you retighten ensure that the wheel continues to turn freely. What is the Kiwi Wheel made from and how do I finish it? The Wheel part of the Kiwi is made from composite materials (customwood) so it is actually more stable than solid timber products. The rest of the wheel is made from Southland Silver Beech. As with all wooden products a protection from dry moist climates is achieved by coating the product with a finish. Either the Ashford wax finishing kit or a Danish oil finish would be suitable. The customwood can also be stained with NGR stain and lacquered over the top. 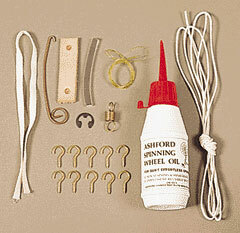 I have recently purchased an Ashford Traditional Wheel and assembled it. I’ve placed the DD belt around the wheel, whorl, then the wheel again and under the bobbin and attached it with a square knot. Is this correct? Yes, you are correct. The result is the bobbin rotates faster than the flyer due to the smaller whorl on the bobbin. When drafting the yarn, the drive cord slips in the bobbin whorl, but when you release the tension on the yarn, the bobbin accelerates to the speed it is being driven and pulls the yarn onto itself. To vary the pull on the yarn, loosen or tighten the belt tension. How can I tell if my Traditional Wheel will accept the double treadle conversion kit? To identify if it will fit, the front treadle rail should be 19 3/4″ long. Earlier models (pre 1972) were about 2″ longer. How do I prevent my Ashford Traditional Wheel ‘walking’? 1) Try attaching rubber feet (available from hardware stores) to the ends of the three feet if the floor surface is wooden. 2) ‘Walking’ on carpet suggests too much horizontal pressure, rather than vertical. Try pushing down with your ankle, rather than away with your leg. 3) The wheel, flyer or bobbin may not be rotating freely. a) Remove the drive cord and brake band, and conrod from the crank. b) Rotate the wheel. If it stops quickly the wheel bearings need oiling. c) Move the con rod up and down. If it does not move freely, lie the wheel on its ends and drip a little oil into the holes in the legs for the treadle pins. d) Re-attach the con rod to the crank and secure. Oil the con rod bearing. – the bearings are clean and lightly oiled, and at 90 degrees to the flyer shaft. – If the bobbin is tight on the flyer shaft use a 1/4″ chainsaw file to ream it out slightly. – there should be 1-2 mm (1/16″) end float between the flyer bearings and bobbin. 5) Smooth the groove in the bobbin whorl so the brake band doesn’t catch. 6) Cut the brake and between the tension knob and screw eye and add a second tension spring. 7) Replace the drive cord and brake band. Do you plan to make a Jumbo Flyer for the Joy? Due to the outrigger style of the flyer we have decided it is unwise to offer a Jumbo size Flyer for the Joy as it could potentially be damaged by a heavier bobbin. The Joy is first and foremost a light-weight portable wheel and to beef it up to take a Jumbo Flyer would unfortunately make it heavier. The plastic drive band on my Joy Wheel seems to be slowly stretching making it hard to maintain proper tension. Is there a way to stop the stretching or get it a little smaller? The drive band can be cut and rejoined by melting the ends with a gas flame (a match is OK but tends to carbon up the joint slightly), then just push the ends together while the material cools. We recommend loosening the drive belt tension when not in use by popping the belt off the flyer whorl and letting down one speed. While spinning with my Joy Wheel the machine moves along easily, however when I start plying, the treadling becomes harder. Why does this occur? 1) Smooth the bottom of the bobbin whorl groove with sandpaper or scotchbrite. 2) Apply a drop of oil to the bobbin whorl to allow the brake band to slip more easily. 3) On the Joy we drill pilot holes beside the holes for brake tension knob and threading hook knob. These pilot holes allow you to swap the screw eye attached to the tension spring from one side to the other as well as the tension knob and threading hook. Have the spring on the left when spinning (clockwise) and on the right when plying (anticlockwise). The tension spring lets the brake band slip which makes treadling easier. 4) Cut the brake band between the tension knob and bobbin whorl and add a second tension spring. This means there is no need to swap the tension knob from side to side. Springs are available from Ashford dealers all over the USA. My Elizabeth wheel has been moved so many times in the last 12 years that its wheel is very wobbly. The spokes are very loose and there is a wide gap (around 1/4 to 3/8 of an inch) in the center of the wheel where the spokes go in. Could you give some suggestions of what and what not to do to repair it? It’s a relatively simple repair job. Remove the crank, prise open the hub so it’s in 2 pieces but make a mark so you can put the spokes back in the same holes. Use regular wood glue on the spokes and hub and glue it back together clamping it with 2 G clamps. Leave the crank through the hub so the hole remains aligned but remove it and clean out the hole for the hub pin before the glue dries. Check if possible that the rim and crank are at right angles so the wheel will run true. If this is unsuccessful a replacement wheel can be ordered from your local Ashford dealer. How do I keep my wheel from putting too much twist in the yarn? How do I get the wheel to slow down and still turn the bobbin to wind on the yarn? To slow the wheel down treadle slower. One treadle per second is a nice speed. If the yarn won’t pull onto the bobbin check that there are no snags in the flyer orifice. Possibly in manufacture these weren’t removed & they are catching the yarn & preventing it from being pulled onto the bobbin. If there are snags, scrape them out with a file..
What can I do to my Elizabeth wheel to keep it from getting out of alignment when I travel? For easy treadling check the alignment of the wheel supports with the wheel. You can unloosen the bolts securing them into the base with the 4mm allen key which came with the kit, then twist the wheel supports until the wheel turns freely & retighten. Check that the flyer bearings are at right angles to the flyer shaft. If not twist the upright into alignment. If you have set it up for double drive then the drive belt goes around the wheel, around the larger pulley on the flyer, around the wheel again & around the smaller bobbin pulley & tie the ends together. Check that the bobbin rotates very freely on the flyer shaft. If not the bearings may need oiling. If in extreme cases that doesn’t help, then the bobbin bearings may need to be reamed with a 1/4″ round chainsaw file. If you handle your Elizabeth reasonably carefully it should remain set ready to spin. Why are there two tension springs on the Joy? We include two springs so that when plying, the brake band will flex rather than pull against a fixed point (tension knob). Folk have generally found it harder to treadle when plying and two springs seem to make it easier. I would like to dismantle my large drum carder to remove some fluff from the bearings – is it possible to do this without interfering with function? Yes, it is reasonably easy to dismantle your drum carder for cleaning. Just remove the handle and 4 screws securing the right hand side to the tray and back rail. Then slide the side off and clean the bearings on the right hand side. The left side can be moved sufficiently to get in with a hook to catch the tangled fibres. If it’s bad, then I suggest a complete disassembly. Hammer the tension pins out of the shafts. Then the carder will come completely apart. Take care to note how to reassemble it and the direction of the card wire teeth where they touch. Where should I be oiling my drum carder? There are oil holes in the two nylon eccentric bushes holding the small drum. try a drop of Ashford Spinning Oil or similar light oil into these and also the two bearings supporting the large drum and the two bearings into the idler pulleys. My drum carder is very dirty, how do I clean it? The best way to clean the drum carder is with warm soapy water. Wash the carder teeth carefully with an old toothbrush and some mineral turpentine. You should also check to see if there are any fibers wrapped around the shafts. If so clean them out with a fine hook or needle. For best results you may take some of the carder apart. 7. Reassemble the right side, tightening the screws. Put the handle in place, adjust the front drum and tighten the bolt. If it is really jammed up, remove the C-Clips from the shafts so the whole machine can be disassembled, but take care not to let the clips fly into your eyes or just disappear. Why am I getting shades of rust when mixing the dyes? The dyes are very strong so it’s easy to get mud (or rusty shades). When you use the rainbow dye method with the correct quantities, and instructions…a wonderful spectrum of colour is produced. The slower you cook the pot, the clearer the colours. I am Interested in taking up tapestry weaving. Please tell me the sizes of your looms. Why should I choose an Ashford loom? The Ashford company has been in business for over 60 years and has distributors world-wide always on hand for advice and after sales service. Why can’t I get my edges right when weaving a plain twill? Beginning weavers are frequently frustrated because the edge thread of the selvedge does not weave in. In this case, take out the rows you have woven and start your weaving from the opposite side. If you change the direction of your twill, you must change sides again. How do I decide what kind of yarn is best for my project? Usually it is best to try a sample of each yarn you are considering. People seem to be changing to Tex solv heddles. Why is that? The Tex solv heddles are strong and light weight. This makes the shafts lighter to lift. Sometimes the heddles tend to rust. Can I make a rug on the Rigid Heddle loom? Yes, certainly. Use a beater after each row of weaving rather than the heddle. It makes a firmer rug.